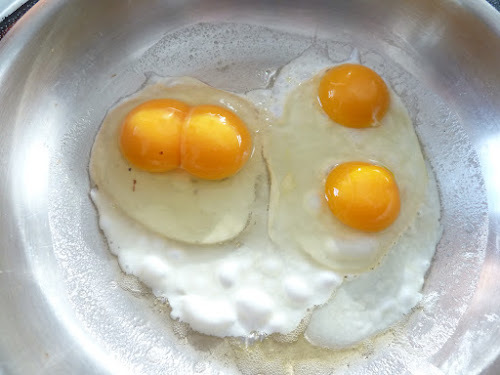 My Home and Garden: Double yolkers!! My friend Ellen gave me a dozen of her beautiful eggs for Christmas. She must have the hardest working chickens on our peninsula. There were TWO double yolkers in the carton. We had what we call 'hot eggs' for breakfast this morning. Put two eggs in a fry pan. Stir them so the yolks are dispersed all through the eggs. Put a layer of a good white cheese over it and a liberal amount of Louisiana Hot Sauce. Let them cook, fold in half and cut in half and we share it. I am going to try a frittata this week. Thank you Ellen.